Signed by President Franklin D. Roosevelt on February 19, 1942, Executive Order 9066 called for the incarceration of 120,000 Japanese Americans during WWII. Every year, the Japanese American community in Chicago comes together to commemorate EO9066 as a reminder of the fragility of civil liberties in times of crisis and the importance of remaining vigilant in protecting the rights and freedoms of all. 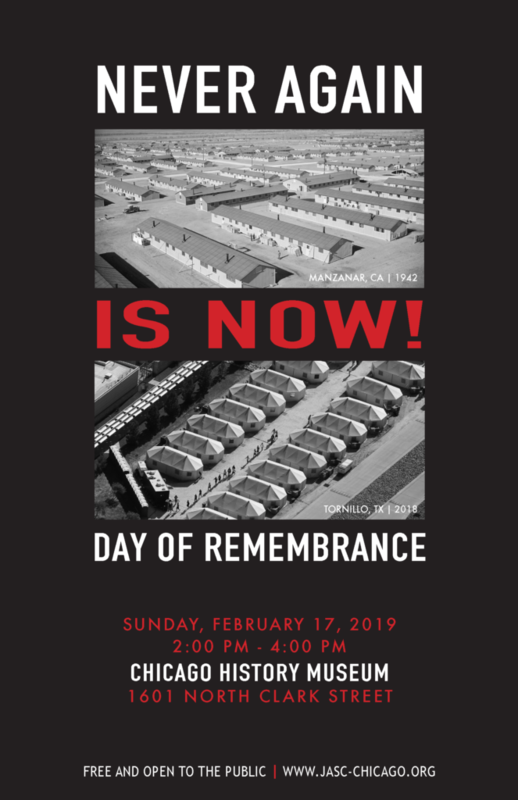 On Sunday, February 17 from 2:00 – 4:00pm at the Chicago History Museum (1601 N. Clark St.), DAY OF REMEMBRANCE 2019 features a keynote address from KAREN KOREMATSU, Founder and Executive Director of the FRED T. KOREMATSU INSTITUTE and the daughter of the late Fred T. Korematsu. Since her father’s passing in 2005, Karen has carried on Fred’s legacy as a civil rights advocate, public speaker and public educator. Ms. Korematsu shares her passion for social justice and education at K-12 public and private schools, colleges and universities, law schools, teachers’ conferences and organizations across the country. Karen’s work, and her father’s legacy, extends to advocating for civil liberties for all communities, and she addresses current issues that draw lessons from the past. Meet the speaker at the reception following the program. Join JACL Chicago’s Next Generation Nikkei for a youth discussion and reading of “Fred Korematsu Speaks Up” and “Baseball Saved Us”. We believe it’s important to begin the discussion young to encourage learning about the Japanese American incarceration history, inspire curiosity on the topic, and provide a space to begin to consider what this means for their world today. There will also be a handout given at the end as a resource for continued learning on incarceration. Join JACL Chicago’s Next Generation Nikkei for a young adult workshop on historical and present-day examples of incarceration. We will explore the connections between WWII JA incarceration, immigrant detention, and the effects of mass incarceration. Come by to learn something new, challenge your perspective, and connect to other young adults who are thinking about and organizing around these issues.